The 39th match of IPL 2018 being played between RCB and SRH Rajeev Gandhi International Stadium Hyderabad. 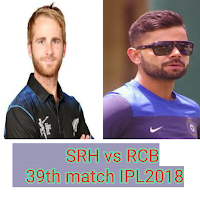 Tim Southee and Mohammad Siraj got 3-3 wickets. Chahal and Umesh Yadav got the 1-1 wicket. SRH all out at 146 in 20 overs.